The medical history development numbers many centuries. Siberian pioneers were from different regions of Siberia and used traditional folk methods in a treatment. First professional doctor was an exilor Fidler, who came to Siberia in 1607. More than 100 years later, in 1737 according to the Government Act in “noted Empire cities” the city doctor post was introduced. First Irkutsk doctor became Iogann Waxman. In 1772 in Irkutsk first medical establishment appeared– “smallpox house”, and in 1784 first mass health action was done – a quarantine was announced in Irkutsk region. On Jan 19 1797 Doctors administrations were introduced in Guberniya cities (regional capitals), which were responsible for health situation in the whole region. In 1799 first “state” drug-store was opened in Irkutsk. There were 40 doctors and 8 drug-stores in the whole Eastern Siberia in 1851. One of the first private drug-stores in Irkutsk was owned by Dines. Then appeared free drug-stores of the pharmacists – collegiate secretary Von Schulz and Ferdinand Mener. The third drug-store was called state prescription office. It was the place where the medical drugs were given according to the Irkutsk doctor’s directions. 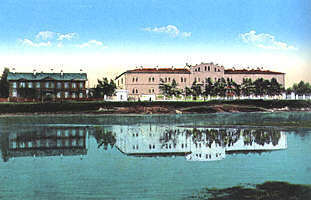 Most of the medical establishments in Irkutsk were built thanks to personal initiative of merchants and industrialists. In 1806-1807 Irkutsk a merchant N.S.Chupalov built the civil hospital on the Naberezhnaya St. (Embankment St.), projected by a famous architect A.I.Losev. In 1863 on the place of the decrepit hospital, a new one was built on the funds of an honored citizen, merchant E.A.Kuznetzov. In 1884-1888 a house for doctors, a drug-store, psychiatric department, inflectional houses appeared near the hospital. Among the medicine development sponsors were first class merchant M.V.Mikheev, who opened the third drug-store in 1890. In 1895 a famous gold-miner Ivan Bazanov and his wife Mariya Bazanova opened city children hospital – Ivano-Matreninskaya, which had therapist and surgeon blocks, ambulatory building and a drug-store. A hospital was built on the funds of merchant Medvednikov. In the 1920s Irkutsk had 7 hospitals, where 20 doctors and 28 assistants worked. There were 9 ambulatories, served by 29 doctors. In addition, 5 doctors went to treat the patients in the houses. When Irkutsk University was opened, its Medical Department began to prepare professional doctors. Today thee are 46 municipal health establishments, including 13 hospitals and 25 policlinics. Besides it, medical centers were opened in the city – not traditional medicine, medical-social, psychological and psychotherapist aid. In 1999 the Diagnosis center began to work. The War and Labor veterans hospital was opened. One of the main medical institutions in Irkutsk is the Regional Hospital – an important consulting, organizing and methodics center of health protection in Irkutsk region. 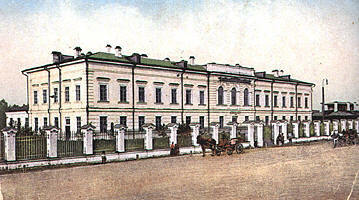 Its history begins since Kuznetzov’s hospital. Siberian department of the scientific center of reconstruction surgery, heart-cardic surgery, neuro-surgery, allergologic centres work on the basis of it. In 1989 Irkutsk department of Eye microsurgery hospital was opened. This medical institution is famous for high level of medical services and the best surgery equipment. Unique medical institution – modern diagnosis center was opened in Irkutsk in July 1999. The project organizer was a famous Japanese firm “Marubeni”. The center is equipped with West-European, Japanese and American devices. The computer net, being constructed there is to undertake TV consulting with the leading clinics of USA, Japan, Western Europe, to organize Internet connection with the TV-medical consulting center in Houston. Eastern-Siberian branch of Russian Academy of Medical Science Siberian Department (which united more than 10 scientific-research establishments) was created for successful development of the medical science in the region, rapid problem solution, connected with keeping and strengthening population health in Siberia in 1987. 2 not-state Institutes – plastic surgery and medical-ecological eye vision problems, experimental dentist center – were opened in the city.